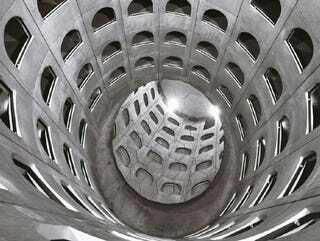 The Célestins underground parking structure in Lyon, France holds more than cars. A unique rotating mirror at the base, when viewed through an above-ground periscope, also holds the imagination of anyone peering inside. The seven story underground parking structure is home to a giant rotating tilted mirror, which reflects the walls of the structures central drum. When viewed from the surface via the periscope, the offset of the mirror makes for a very odd illusion, one of a tunnel spinning inside the earth; clever, confusing and ultimately whimsically entertaining.